Each day during the course of business, we set out to accomplish our to do list, whatever that may be. Usually, it consists of a combination of tasks, some of which we are more comfortable with then others. My typical day includes updating my blogs, checking on e-mail, working on freelance projects for my clients, of course, contacting possible new prospects, and keeping up with communications technology, which can be daunting at times. Sometimes, I feel like if I miss even a day reading tech crunch or mashable, I will be out of the loop and rushing to catch up. I'm sure many of you feel that way too. Four years ago when I launched carriefreelance.com, I was afraid. I had worked on web sites before, but never one of my own, for myself. How much should I say or not say? What links should be included? Photos? Resources? If I didn't do a great job, would I pale in comparison to others, and lose business? When I launched carriewriterblog.com, I felt the same fear. I had always written and kept journals my entire life, but this was an online journal now, and a very different animal. Still, I moved forward, teaching myself tips and tricks along the way, and best practices, and yes, I even had some fun doing it. I took on new challenges, like writing a successful white paper, a format I had never used before, and more recently, learning IMovie and making videos. I was and am proud of what I accomplished, and I have learned that being afraid at first is not a terrible thing. It is much like procrastination - if we just sit down and start a project, chances are we will get through it fine and wonder the next day what we were so worried about. Today, with technology advancing at a fierce rate, we know as business people and communicators using technology, that chances are five years from now, it will probably be a whole new ballgame, and there is much we will have to learn anew. Where was Twitter five years ago? Facebook? Blogger? Sometimes it is not technology at all that is daunting, but rather in person challenges, like meeting new people at a party or networking event. Sometimes, we get so used to social networking online, that we forget one of the most important aspects of growing our business is meeting people in person...the old-fashioned way! There are fears we associate with this as well. Suppose we accidentally talk about ourselves too much, just to fill an awkward silence. This is a definite NO online, and isn't great to do in person, either. Suppose we look or sound different then someone expected us to. Are we disappointing them, somehow? When I think about what I am afraid of now, it is more about making sure I'm getting my message out successfully to my current and future clients...my message being "clear communications in a chaotic world," and that they know that I know how important it is for them to have a cohesive message and voice in all their communications. There is also some fear of my own ambition, as I have some lofty goals on my plate that I have still to tackle, and I know that won't be satisfied with myself until I do. But I have learned some good lessons over the last few years, that help new projects seem less daunting. The importance of breaking large projects into smaller tasks, for example. Of keeping organized with a good calendar program, taking breaks when needed, and keeping the big picture in mind. There should be a good reason you are taking on the projects you have chosen - they should have a significant effect on your bottom line, and be worthwhile. Did you recently tackle a project you were afraid of, or is there something on your to do list you have been avoiding? 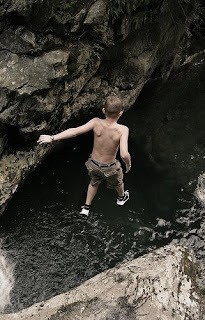 How do you handle confronting your fears and taking the plunge... whatever it may be.